Hello everyone and welcome to Share Your Style Party #169. 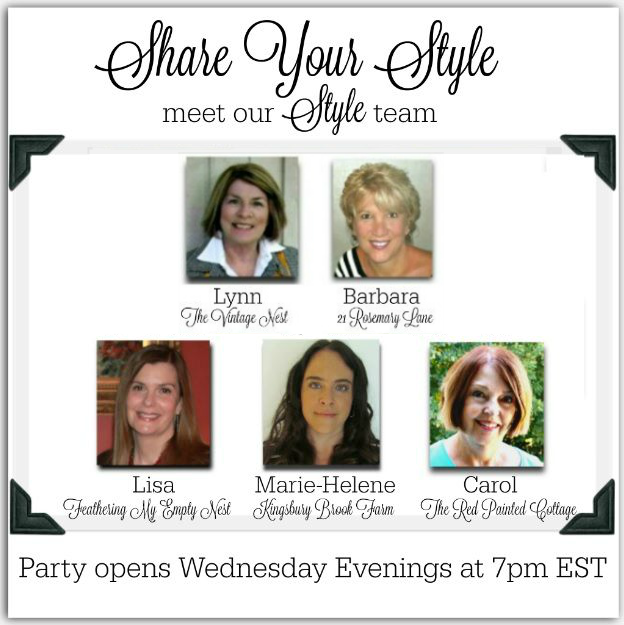 I am Lynn from the blog, The Vintage Nest, and I'm so happy to be your host this evening. What caught my eye this week as I perused through all of your wonderful links, filled with so much inspiration? It's a hard job but here goes. :) Oh.....Happy Mother's Day. Dazzle With Frazzle, shares this charming patio side table project, using an old umbrella stand. I love this! Décor to Adore shares gardening tips with her love of English gardens. Truly this post is a treat for sore eyes and filled with so many ideas for your garden. The Yellow Brick Home, to see her latest garden finds and how she uses them. Marina, a new baby to this world, is so very lucky to begin her formative years in this charming nursery. What a sweet, sweet room and a great learning environment. Visit The Style Safari for the nursery reveal. May is strawberry month. I went strawberry pickin' this past weekend. So Shannon's recipe for fresh strawberry muffins really caught my eye. You can find the recipe for this yumminess at her blog, Home Made Lovely. Perfect for your Mother's Day brunch.